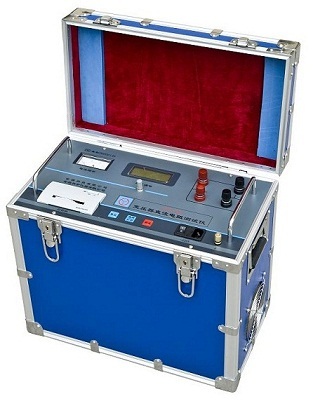 KRI transformer winding resistance tester is a instrument that can test pure resistance impedance of transformer in every winding group, the tested data would be better if shown lower. Through winding resistance testing, we can judge the insulating level of winding group in transformer, or if there is a short-circuit open-circuit, wrong connection among winding circuit, if there is poor connection on weld point, line bushing and tap switch, also through winding resistance testing, we can check if the winding line can meet the requirement of design. After winding resistance testing, we also can check if the resistance of three phase is balance or not. If unbalance, we can check if the unbalance rate in the allowable scope. The testing data should in line with the reference data of transformer plate by which we can further analysis the capacity and quality of transformer. The requirement of phase resistance unbalance rate: as the capacity of power transformer ≤ 1600KVA, the unbalance rate should ≤ 4%, the line resistance unbalance rate ≤ 2%, as the capacity of power transformer over 1600KVA, the both phase resistance’s unbalance rate and line resistance unbalance rate should ≤ 2%, that means if the testing data beyond that value, the power transformer must exist some problem. Kingrun winding resistance tester has strong output current, wide test range, small volume, light weight with easy operation. And JYR series winding resistance tester has large LCD screen with clear display even in outdoor testing work, all tester use high speed microprocessor(MPU) which can judge current, data collect and resistance display automaticly.